This is a combined agreement for couples who are living together and are contemplating marriage. It is drafted to comply with two sections of the Family Law Act / Family Court Act. This is a new type of agreement that has become possible due to a recent court case - see and read the history here, it's important!!. A financial agreement is used when a couple wants to control the distribution of assets in the event that the relationship breaks down, instead of leaving it up to the courts. You can make a financial agreement that deals with all financial matters or you can choose to deal with a single asset like a home, business or inheritance. A financial gives you peace of mind that your assets are protected. It allows you to stipulate and quarantine particular assets or financial resources from claim should the relationship break down. By “isolating” those assets, each party is able to leave the relationship, should the need arise, with the property they brought in. Putting your agreement in writing puts a stop to the niggling doubts and "what if?" questions. This type of legal arrangement is quite common, it takes care of the practical matters and is generally no more difficult than a Will to draft. A financial agreement has to be drafted to be comply with the section of the relevant legislation that deals with the type of relationship involved. So for example, a prenup would be drafted under Section 90B of the Family Law Act and a divorce agreement would be drafted under section 90D of the Family Law Act. There is a section that deals with each of type of relationship. It has been widely believed that a Financial Agreement could not be made under more than one section of the Act but a recent Court case Piper and Mueller  has busted this myth. It means that de facto couples are permitted to make an agreement under both de facto and marriage provisions of the Family Law Act. This BFA will cover them for their current de facto relationship and if they decide to marry at a later stage. This is because only one provision operates when the parties are in a de facto relationship, and the other will operate when the parties marry. This is valuable information for couples who wish to be clear about their finances in the event of a breakdown of a de facto relationship and also a marriage. 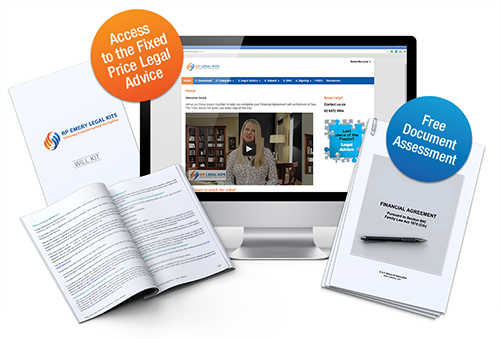 We can show you how to complete your agreement and get the legal advice for just $1787 for both parties – without stress, fuss or engaging combative lawyers. Under section 90G for married couples, or section 90UJ for de facto couples, parties to a financial agreement must receive independent legal advice before they execute their agreement. Independent meaning each party cannot use the same lawyer. b) what rights they give up, including the right to have a court decide on matters that are dealt with in the agreement. So by getting proper legal advice, independent of the other party, the Act makes it near impossible to argue that you didn’t know what you were signing. The lawyers will also make inquiry that the parties are entering the agreement of their own free will and that neither is under pressure or duress to sign the agreement. Our combined de facto kit deals with all the usual issues you may face when dividing financial resources, such as ownership of real estate, personal property (cars, furniture, etc), superannuation entitlements, shares, debt, spousal maintenance etc. Before you choose a Combined Financial Agreement you need to be aware of the legislation for different states. If you are dealing with marriage, the Family Law Act applies and it's the same across all states. The Family Law Act also applies to all de facto relationship in every state except West Australia. The Family Court Act applies to de facto relationships in West Australia. You will need an Combined Agreement drafted to comply with section 90UC and 90B of the Family law Act, where section 90UC deals with defacto relations and 90B deals with relationships before marriage. You will need an Combined Agreement drafted to comply with section 205ZO of the Family Court Act and 90B of the Family law Act, where section 205ZO deals with defacto relations and 90B deals with relationships before marriage. Sample clauses – help you to tailor the document to your own situation – just cut and paste! A Bonus Will kit because you often need to update your Will after separation. Complimentary Separation Agreement Assessment – we check your draft agreement to ensure it’s ready for the lawyers and the mandatory Legal Advice. This is how we save you thousands of dollars in legal fees.